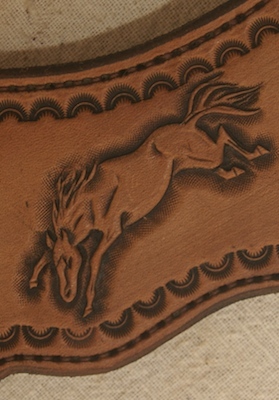 Spurs are usually held on by a leather spur strap that goes over the top arch of the foot. Sometimes a heel chain is used under the sole in front of the boot heel to help secure the spur. Select one of the leather spur straps we have for sale or we would love to help you design your own custom pair of spur straps! We can match your saddle or chinks/chaps. We only make one of a kind! See our Spur Strap Sample page for more ideas! Large style with Brass Buckles. Bucking horse! *Horses will face correctly when straps are on boots.